Happy Friday! I'm off from work today as I mentioned that I would be yesterday. The Pants Monkey and I are going on a beer cruise tonight on Lake Minnetonka (huge MN lake south of Minneapolis) and needed to be there kind of close to when we both get off work, so we thought, let's take one more day off and enjoy some lazy time before we go boating! We're going to go run some errands though, so I am not being super lazy, I'm dressed for the day. This shirt was in my box of goodies from Lynne. It's very similar to the Michael Kors shirt from earlier this week but it's a little more casual. I thought it would be a fun shirt to wear on the boat and all I need to do is add a jacket and I'm good to go! I did add a camisole under this one as it is a little lower cut than the other one, to the disappointment of Mr. Monkey, but I'd rather not risk overexposure or as far as that goes, totally catching a chill on the boat! The rest of my weekend is going to be crazy awesome as well. Tomorrow I'm singing at a wedding - yay extra money - and then there's a MN Blogger get together at the fabulous Megan Bird's house! I am beyond excited to see some of the bloggers I've already had the pleasure to meet and to finally meet some of my other favorites! It's going to be a good time. Sunday we have blissfully free, so we'll probably sleep in and go out for breakfast. Yes, it's going to be a good weekend! I think I'm going to add this hat for the boat tonight too. Just in case it is windy. I totally caught a chill on a boat ride we did up in Itasca on our vacation last month, so I'm being extra cautious, don't need that happening again! I hope you all have wonderful weekends as well! You have such a fun weekend planned! That cruise sounds awesome and I'm jealous of your blogger meetup...enjoy Beth! Lake Minnetonka should be pretty this time of year. The cruise sounds fun! A beer cruise AND a blogger meetup? Lucky lady! And pretty, too, in that top. Cute top...great color! Great outfit for a beer cruise :) Have a fun evening! ah love the color of this top! I'm so jealous you get to go to Megan's house! Have a great time! On the boat, too! That beer cruise sounds like so much fun and so does the get together, it's been so long since I've been to a blog get together. Hope you're having a great weekend! 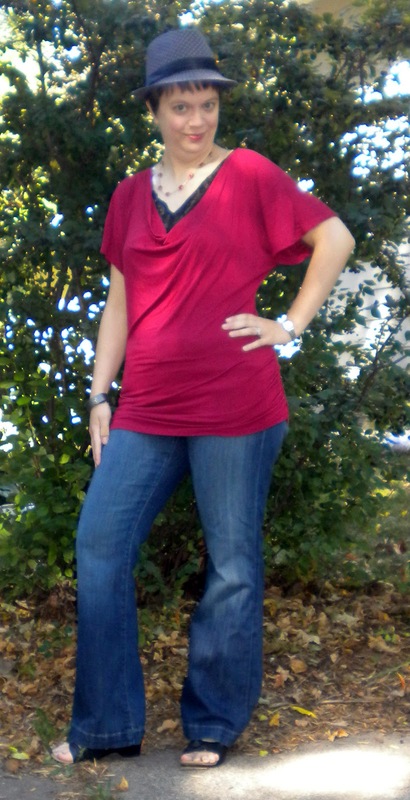 I really love the color of the top, and I really love the drape-- especially the neckline! I've started wearing bandeaus under "risky" necklines because they don't add bulk around the waist. Give it a go! It's always a good day when you have the day off work! :) I hope you enjoyed your time off.